In the U.K I was part of the Grimsby Town F.C 15 Plus development Scheme for three years, went on to short periods at Scunthorpe United and Sheffield United. Have worked with the Humberside F.A School program, and passed my City & Guild Sports and Recreation studies at Lincolnshire University. Whilst I've been in Australia I have passed my FFA /AFC C Licence and I'm awaiting to upgrade this to a FFA/AFC B Licence. 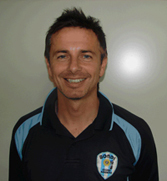 I have been working as a coach at the Bondi Soccer Academy since 2009.